Spring is in the air, and one of our most popular springtime events at Disneyland park is ready to make its return, with plenty of flowers and color and fun! 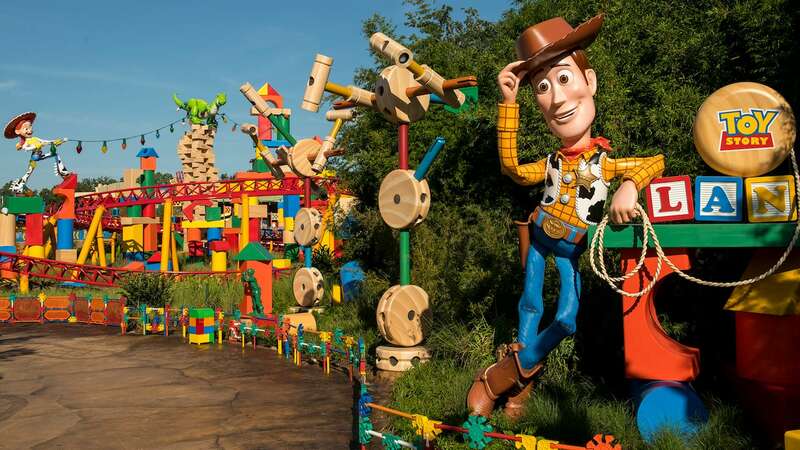 Starting March 20, Big Thunder Ranch Jamboree in Frontierland will be all decked out for the annual Springtime Roundup. Some of your favorite Disney characters will be stopping by to meet you, along with Mr. Easter Bunny and a carrot patch of famous Disney rabbits – from Thumper to Roger! And several times each day, a group of dancing cowboys and cowgirls comes together for a lively hoedown and “bunny hop” that will get you off your feet and joining right in. Springtime Roundup brings all that excitement, plus fresh spring talent from Disney Performing Arts, egg decorating demonstrations, fun crafts, yummy treats and more. It kicks off March 20 at Big Thunder Ranch Jamboree and keeps going daily through April 12. After that, the fun continues on weekends through June 7, so hop on down the Big Thunder Trail and join us! Will the characters be able to give us their autograph? Hi! We have reservations at the restaurant at Thunder Ranch on April 17th, do the characters come around the tables then, or just in the area of the restaurant? 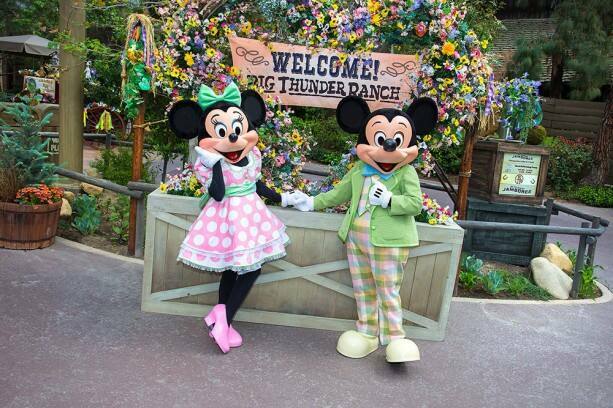 Will Mickey and Minnie continue to greet guests in their spring outfits here through June 7th? Or will they be leaving with the Easter Bunny after April 12th? This will be happy news for my mom. We will be there the 21st to celebrate her 83rd birthday. The Jamboree area is a real favorite for both of us. Will there be a piano player there again this spring? Hello, what will the hours be 3/20/15 – 3/22/15, for Springtime Roundup, at Big Thunder Ranch Jamboree in Frontierland? Thank you for your reply! Carmelle – Springtime Roundup will be running 10:30 a.m. – 5:30 p.m. each day. so does the weekend mean fri-sun? Also will they have the bunny meets until June 7th on the weekends? Chad – The weekend operation for Springtime Roundup does include Fridays (and in some cases Thursdays – see my other responses above). With the exception of the Easter Bunny, who departs after April 5, all the Disney rabbits are expected to continue through June 7. Will Rabbit (from Winnie the Pooh) be at Springtime Roundup? We recently moved to Anaheim just to be near Disneyland for my special needs adult son, and he is wishing to see Rabbit to celebrate spring. Beth – Yes! Rabbit is expected to appear. Please check with the Cast on the day of your visit, though, for specific appearance times for Rabbit. YAAAAAAYYY, I stumbled on this last year, and I will definitely be there again to see my Thumper!! Alison – Oswald will be sticking to Buena Vista Street at Disney California Adventure, but some of the bunnies you might see during Springtime Roundup include: Thumper, Br’er Rabbit, Roger Rabbit, the White Rabbit from “Alice in Wonderland,” and Rabbit from “Winnie the Pooh.” Of course, the Easter Bunny will be there, too, but only through Easter Sunday (April 5). Carolyn, it says it will run through June 7th. Just curious if weekends means Friday thru Sunday or just Sat. and Sun.? Thanks. Aaron – We like to have looooonnng weekends! 😉 After April 12, look for Springtime Roundup Thursday-Sunday (4/16-19 & 4/23-26) and then Friday-Sunday from May 1 – June 7. Carolyn – That’s correct. The Springtime Roundup schedule after April 12 includes two Thursday-Sunday periods (4/16-19 & 23-26). It then shifts to a Friday-Sunday operation from May 1 – June 7. Also, Walt Disney World’s Easter events should be more like this one, including the meet-and-greets wih all the Disney rabbits. I wish I could make it out to DL for this event, to see all those lovable, huggable Disney rabbits. Is the Springtime Roundup going to become an annual event at the park (a la the Halloween Carnival, Jingle Jangle Jamboree, etc.) so I can try and go to it next year? Philip – This is the 2nd year for Springtime Roundup, but you never know what the future may hold. Rest assured, whenever you make it to Disneyland Resort there will be plenty of friendly Disney characters waiting to meet you! That is excellent news! 🙂 I have been waiting for a Parks Blog about this. I am hoping that the amazing egg artists, including Ray Brown — my favorite part of the Roundup — are back for another year of egg-straordinary art! Sherry – You’ll be happy to know the egg art demonstrations will be part of Springtime Roundup through April 12!